We met Tom Mills when he came to the shed the day Jimmy shore the rams. Shearing the rams is the last big thing the farmer must do when shearing is over for another year. Always a glamour event, it brings a small audience of locals to check out what you’ve got and stay for a cuppa. Cutting the wool off these enormous creatures signaled cut-out, a modest celebration when slabs of beer are produced by the cokkie (farmer) and everyone gets pissed, particularly the shearers whose labours over hot sheep for two weeks had finally ended they could now take their aching backs home, their pay checks in their pockets. Tom hobbled in on his stick – “By gawd them’s good rams mate,” he intoned, making my beloved glow with pride. Tom had emphysema and was soon to spend hours on a respirator. I believe that his visit to our shed that day was one of the last times he left the house. He had been a shearer and, like most old shearers, had seen better days. When we met him he was a sick man, but he knew a thing or two about sheep and, like Jimmy, this made him invaluable to us. He became one of those people we cared about. 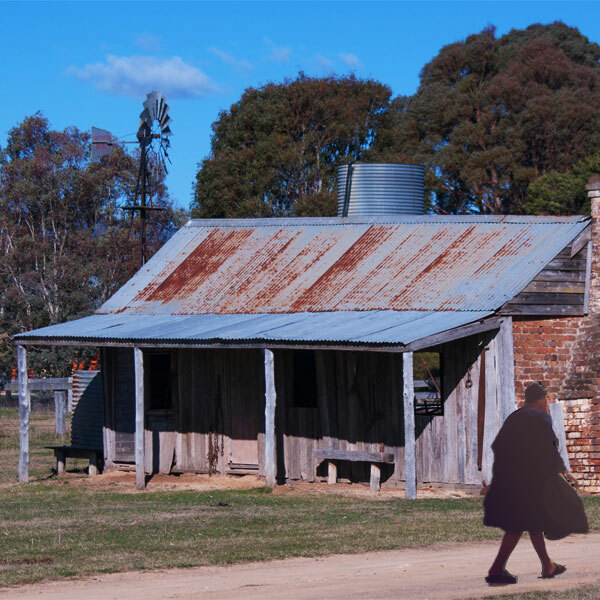 Like Jimmy Steele, ‘Poor’ lance and Stumpy, from the Mills family, all old bush codgers living nearby, ‘Old’ Tom was childless and womanless and like them had drawn-in around Dorrie Mills through loneliness and need. Everyone understood that without her selfless devotion these men would have gone down the toilet of alcohol and despair. Men without women, I called them, a group sometimes found in the bush, old boys, ex-shearers, broken by booze and toil. These men, who often worked for us in the sheds or if there was fencing to be done, were different – they had Dorrie. Her ‘family’ kept loneliness from HER door as well, although I think if they all died she had the resources and strength of spirit to be content with her animals and her garden. Dorrie, the Queen Bee, the great survivor of the Mills family, had the substance of fable. When Woody Allen said, “Don’t give me reality, I want magic!” he might have been startled by one such as Dorrie Mills. She was reality on legs – practical, earthy, cranky, tired, overworked, old too soon, sexless, ageless, timeless, joyless, childless, worn to the bone, unattractive, sneaky, shrewd, sly, indestructible and tricky as hell. She was also a warm, lovable, resourceful, caring, generous human being. We loved her and her world of horses, foals, pigs, chooks, peacocks, ducks, poddy calves and lambs, vegetables, flowers, mutton soup. Also cakes, cookies, jams, chutneys, preserves. Dorrie had more uses for mutton than an Italian had for pasta. Mutton came from the demise of old, male, desexed sheep, called wethers. With the quality of its wool declining wethers were generally slaughtered to feed the dogs. Mutton, however has a cuisine all its own and cooked in wine with herbs for long periods of time, is delicious. To Dorrie it was a cheap means of feeding her flock, a staple. She even made soap from mutton fat. When feeling especially expansive she would press a block of this foul smelling stuff into your hand when you left to go home, as though it were gold bullion. She distributed bounty from her kitchen, veggie garden, orchard and chook house. She sold us a couple of peacocks and a very good sheep dog, bred by her. She lent us her horses, she looked after my young son one day when we had to leave unexpectedly for the city. Decades later we still talk about this wonderful old girl. I could probably write a book and never say the same thing twice. She was the goods, a oncer, a one-off, a rarity from a breed of Australian bush women. No one knew her age or her background, she was a mystery. Hers was the sun-ruined complexion of one who worked day and night, through heat, snow, rain, wind. Hers the face and watchful eyes of the farmer who sees everything. She was the cat with nine lives from fable – only she lived them simultaneously. When all around her were crumbling with limps and coughs and back issues - she reassuringly stayed the same, looked the same, forever tapping her foot in an impatient rhythm, itching to get back to some urgency, real or imaginary. And yet she was feminine. The tireless mothering of animals and her boys were testament to that. She grew flowers and picked them, mostly for other people. Her biblical energy, her kindness, all grounded on a strong religious-based concern for ‘God’s Creatures’, was real. She was real – REALITY ON LEGS. She was permanently exhausted. But had trouble sleeping. This was the only time she had spoken in an intimate fashion to me. She confided that her doctor had told her, when she had an urge to sleep, to “lie down and sleep, without delay”. She found this hugely amusing. Sleep, like lipstick, was not part of the plan. Her fuel was nervous energy and the burden of her responsibilities on the farm not only did not allow for rest, but were her reason to be, in a very real sense. A few years ago someone rang to tell me that she had passed away at the age of 97. This was the first real thing we ever knew about her. To us she was ageless, indestructible, almost a creature from myth.